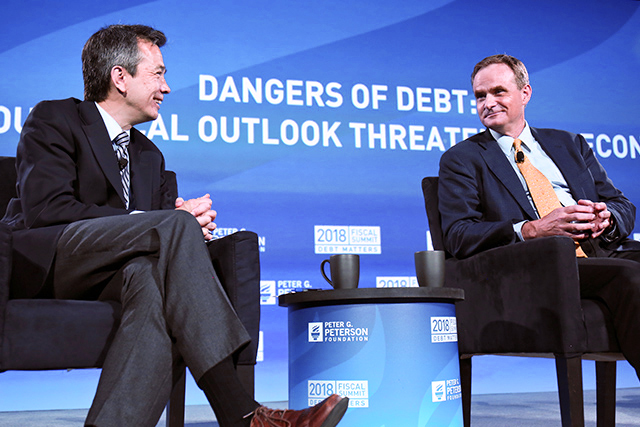 Wall Street Journal Chief Economics Commentator Greg Ip moderated the day’s next panel, which brought together voices from the private sector and academia to analyze the risk that high and rising debt poses to our economic future. The wide-ranging conversation focused on the key drivers of our unsustainable ﬁscal outlook, the potential for interest costs to crowd out other budget priorities and aﬀect private sector growth, and what it will take for a political solution to the debt crisis. Steve Rattner, Chairman and CEO of Willett Advisors, called our ﬁscal situation “more dangerous than usual,” citing trillion-dollar deﬁcits “as far as the eye can see.” Rattner said he is concerned not only about a market reaction and a credit crisis, but also about the possibility that markets won’t react and that debt — and the risk — will continue to rise unabated. In addition to the eﬀects of recent legislation, Johnson highlighted healthcare spending as a key driver of our structural deﬁcits going forward, saying, “we cannot turn around the ﬁscal ship unless we get a control on healthcare spending relative to GDP.” Rattner agreed that healthcare spending must be addressed, but said, “I don’t believe this can all be done on the spending side, and I don’t believe it should be,” arguing that new revenue must be part of the solution. Download a PDF version of the session.